A data visualization app called Flourish has been getting a bit of buzz recently, so I decided to check it out. I noticed a slick existing template using 3D WebGL for illustrating global trade flows. I have a perfect dataset for that! A link to the graphic itself (without the story) is here. One word of caution. No matter how slick a graphic looks and performs, it’s only worth as much as the underlying data. In this case, we know that UN Comtrade data for mercury has some serious flaws, including errors and missed reporting by importing and exporting countries, to say nothing of illegal trade (we discuss these issues in the report). Nevertheless we believe the data is still useful in providing an overview of global trade. But please keep the limitations in mind. If you’ve been anywhere near the internets recently you know that animated gifs are ubiquitous. Never one to miss a trend, I decided to make an animated gif – of a map of course. Actually, gifs can be a good way to show movement in maps and charts. Here are some nice examples and tips. The animation shows which countries are Parties to the Minamata Convention. They appear in order of ratification. Alasdair wrote a useful tutorial on how to use QGIS to create amimated map “geogifs”. I’d been looking for an excuse to play around with QGIS (a free desktop GIS application) for a while. In general I found QGIS quite easy to use and feature-rich. My only complaint is not limited to QGIS but applies to all graphical user interface apps. While they are much easier to get started with, they lack the ability to create a reproducible workflow. If I had to make the map again from another dataset I’d have to remember and recreate all the pointing and clicking I did to make the first map. Whereas with something like R one could write a script and use it to reproduce future maps. But perhaps there are some features in QGIS that I am unaware of that could help with reproduciblity. Data for the map came from my existing Minamata Convention map on CARTO. I exported the shapefile and used it to create the layers in QGIS. My approach differed a bit from Alasdair’s because in my map not all the polygons are highlighed, only the countries that have ratified. Incidentally, I was not able to create this animation in CARTO because it only allows animation for points, and I needed to show polygons (country borders). After exporting 84 frames I used gifmaker.me to make the gif rather than the GIMP or Photoshop. Worked just fine. When I was a kid I would ask my Mom what she wanted for Christmas, and she would usually say, “Don’t buy me anything. I’d prefer if you just make me something instead.” I’d always think this was strange. Why would she prefer a silly drawing or collage when she could have something nice, shiny, and new from the store? Now you might think this is silly – which it is – but it really got people’s attention, and now coffee contributions are way up in 2018. So by that metric it’s an effective visualization! Sometimes you come across a dataset so interesting you just have to stop everything and visualize it. That’s what happened when I saw a tweet from @JulesGrandin about the THOR database. THOR stands for Theater History of Operations Reports, and it’s a massive database published by the U.S. Defense Digital Service of all releasable U.S. air operations, including WWI, WWII, and the Korean and Vietnam wars. The data on WWII, which I downloaded, also includes Royal Air Force missions as well as some from the South Africa, Australian, and New Zealand Air Forces. And here is a map of all the bombing missions colored by aircraft type. You can clearly see the prevalence of the B17 in the European theater, the B29 in Japan, and the P51 in China. Zoom in and click on the individual points to view other attributes of the bombing missions. These maps barely scrape the surface of what is possible with this dataset. In addition to aircraft type there are many other attributes, including air force, unit, target type, bomb type, and tonnage of bombs dropped. This page from the Defense Digital Service provides some more interesting tidbits gleaned from the WWII data. 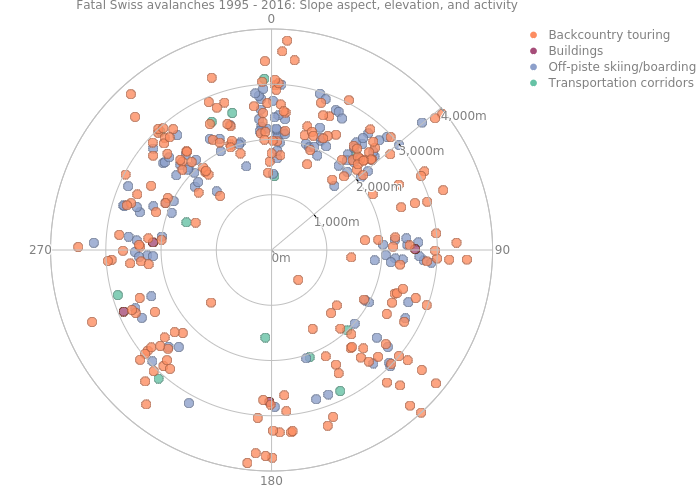 In my previous post, I explored a dataset on fatal avalanches in Switzerland from the Swiss Institute for Snow and Avalanche Research (SLF). The dataset also contains the location of each avalanche, and here I’ll explore a few ways to show the data geographically. In the map above, the location and date of each avalanche is used to make a time lapse with CartoDB’s Torque function. Each flashing white marker is one fatal avalanche. Besides the general location of avalanche risk in Switzerland and the seasonal pulsation of events, this map does not convey all that much information. However, I think it is worthwhile because it drives home the sheer number of deadly avalanches – 361 – during this period. We have to keep in mind that each of these flashing markers is a separate tragedy that together represent the loss of 465 lives. This map also lends itself well to exploration. The Open Street Map base has great detail upon zooming, and you can click on each point to get more information about each avalanche, such as elevation, aspect, date, and number of fatalities. Finally, here’s a heatmap showing the density of fatal avalanches, with red areas having the highest densities. The cantons of Valais (in the southwest) and Grisons (in the east) have the highest concentrations of deadly avalanche accidents. I used a Landsat mosaic as a base map, which allows for comparison of the relationship between terrain and avalanche density. All avalanche data from WSL Institute for Snow and Avalanche Research SLF, 25 March 2016. Data and code available here. Maps generated using CartoDB. This map shows positive media coverage of refugees over the past 24 hours (updated hourly). Each animated marker represents one positive media mention about refugees in a particular location. The data comes from GDELT (The Global Database of Events, Language, and Tone). GDELT’s Global Knowledge Graph monitors media in 65 languages around the world and uses algorithms to measure the emotions and tone of the texts. The map shows results on the theme of “refugees” with a tone of greater than two. Tone is the most basic GDELT parameter, and measures how positive or negative a media article is. So, for example, this article about how churches in Kansas and Nebraska are ready to help refugees is included in the dataset. This map is a nice demonstration of some useful CartoDB features, such as sync tables, animation, and custom map projections. This returns a geojson file with all the results over the last 24 hours tagged with the “refugees” theme. Using CartoDB’s sync tables you can set the data table to update automatically. Mine updates every hour. I filtered the results to only include articles with a tone score of greater than two (positive coverage), and then used CartoDB’s Torque tool to create the animation with a custom marker (the heart). The map projection is a modified Bonne, with the standard parallel set to 90 degrees North to make it appear more heart-shaped. Here is a useful tutorial for using different projections in CartoDB. Inspiration came from this blog post, and this tutorial was very helpful in figuring out how to use the GDELT API. You can access the data from my CartoDB page here and easily create a map of your own. 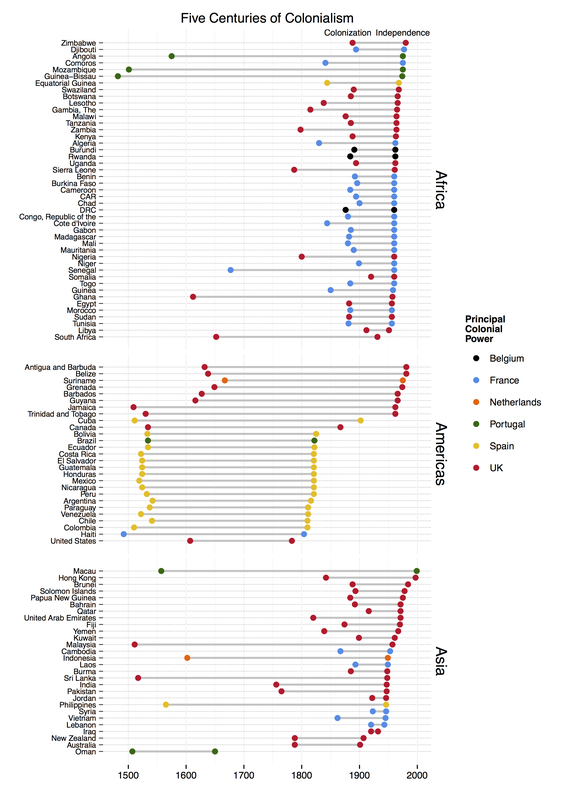 The chart shows the dates of colonization and independence of 100 current nations. The countries are organized into broad regions (Asia, Africa, and the Americas), and sorted by date of independence. Color represents the principal colonial power, generally the occupier for the greatest amount of time. There are many interesting patterns visible in the chart. For example, you can clearly see Spain’s rapid conquest of Central and South America, and then even more rapid loss of its colonies in the 1820s. The scramble for Africa in the late 19th century stands out well, as does the rapid decolonization phase of the late 1950s through early 1970s. To reduce complexity to a manageable level, I set some limitations on what countries to include. First, the chart shows only those countries victim to Western European colonialism. I don’t include Ottoman, Japanese, Russian, American, or other colonial empires. I also don’t include territories that are still governed by former colonial powers (e.g. Gibraltar). This gets controversial and complicated. Countries that were uninhabited upon discovery by colonial powers are also not included. The same with countries that later gained independence from a post-colonial state (e.g. South Sudan). The dates of independence come from the CIA World Factbook (here). Dates of colonization were derived by my own research, mostly from Wikipedia country pages. I quickly found that establishing a date of colonization is a somewhat subjective decision. Do you choose the date of first European contact? Formal incorporation of the territory into the colonial empire? For the most part, I chose the date of the first permanent European settlement. Notes on the rationale for the date chosen are include in the data spreadsheet (below). In looking at the chart, it’s important to remember that in many cases colonial subjugation was a long process, moving from initial contact, to trade, conquest, settlement, and incorporation. The response from the #rstats and dataviz community was extremely constructive and useful. Users @hrbrmstr, @jalapic, @ramnath_vaidya, and @plotlygraphs all provided great examples (here, here, here, and here, respectively). In the end, I chose to adapt the approach taken by @jalapic. A quick note on color: I choose colors from the flags of the principal colonial powers to represent them on the plot (except for the Netherlands for which I picked orange). The idea is to make it easier for the viewer to match the color with the country without having to always go back to the legend. I’d be interested in any reactions to this approach. In general, I’d be thrilled with any feedback on how to make this plot better.